They threw away their gas masks when it became evident that the Japanese were not going to use poison gas. They used the bag for carrying grenades, canned food, and other things. Can you also post the Phil. Commonwealth Army gears if there are any difference? Thanks. Then you need a bolt-action rifle particularly the 1917 Enfield with the corresponding bayonet. As a substitute to the guinit helmet, you can use a floppy denim daisy mae hat. The one that looks like a denim boonie hat. We are going to Fontana at Clark tomorrow. I'll try to find time to visit the 26th cavalry memorial regiment. My PS Impression (Infantry ) is almost complete except for the Garand and the army wool shirt. I have started on my 26th cavalry impression . Initial acquisitions are the ff: Gas Mask bag, M1930 Campaign Hat, EM Service Hat Insignia, Cavalry EM collar insignia, M1917 pistol lanyard but my M1911A1 pistol is dated 1944. I'll try to post them later and may I seek your comment if I am getting the right stuffs? I have chosen to start with the cheaper items before the heavier stuffs ( M1931 Boots, Breeches, etc. ). The Phil. Commonwealth Army Impression may be last if I still have the budget. Congradulations bulikiti2 for getting your 26th PS together. I wish you could have joined us! Hope to see your pics and hope you join the new Fort Stotsenberg, Pampanga PS chapter soon. All the best with your impressions. Like yourself this forum and it's members helped me a lot. I think you'll struggle with weapons because of the Law in the Philippines. I don't know maybe they can issue an exemption or a permit to own a replica or deact guns to people who can actually prove that they are a reenactors or doing it for historical purposes. Lobbying for this may be something to think about. Airsoft now is legal in the Philippines, I believed you have to establish that you're a skirmisher and that you're in a group. I'll ask my friend who organised events in the Philippines. I say this because they do a wicked M1 Garand and M 1911 hand gun. An option if you can't get a deact one. You can own a rifle in the Philippines... you just have all sorts of different monthly permit fees for ownership, and different monthly fee for transport... etc. Congratulations on your PS impression Bulikiti . When will we see a PS version of Sgt McShine? Thanks guys. This forum is really very supportive. If just hope the authorities would have the same enthusiasm and understand what is reenacting. If only the airsoft guys could shift to reenacting at the same time, then we could be a strong lobby group. I have posted an invitation at FAS hoping to establish a trend. I will start posting my impressions very soon and do it at FAS also to encourage whoever is out there to band together and take airsofting to the next level. I have been airsofting in my PS and WWII gears. I just haven't touch base with the right group. MABUHAY KAYO KABAYAN! I thought reenacting and airsoft had a natural cross-over for everyone. Over the years I realized the cross over is very limited in either direction. I think you have to have the military history bug in you to cross over from airsoft into reenacting. And for reenactors to have some "cops and robbers /baril-barilan" bug in them to play airsoft. Compass MANUFACTURED BY SUPERIOR MAGNETO CORP. l.I. CITY NY.. U.S.A. I don't know. Probably. I'll see if I can ask a vet. For PS Infantry, when and how do you wear the campaign hat. If worn together with the army wool shirt ( M1937? ), do you wear it with the leggings or just the pants and the ankle boots? The campaign Hat was worn with different class uniforms either with leggings or not. They were commonly used in the field. 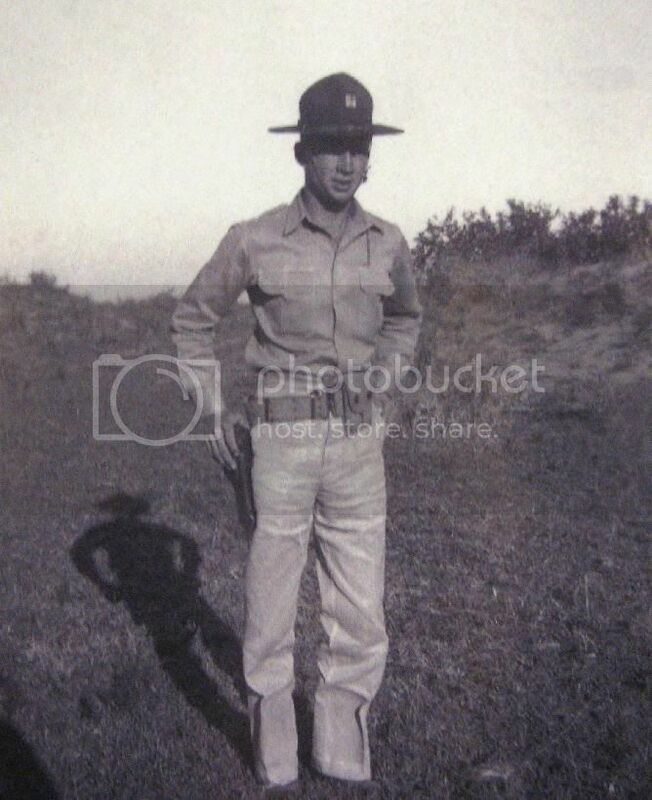 For Infantry the chin strap was shorten to fit behind the head, like drill instructors wear them. Cavalry wears the chin strap in front under the chin. Who told us about the chinstrap? Because here's a picture of Col. Olson 57th Infantry with the chinstrap under the chin. With Officers, It is obvious Rank has it's priviledges. ;D But these are how it is generally worn by Infantry and cavalry. Best is to ask a Vet. could be an alternative to finding a serviceable original U.S. I am in agreement with Vic in that SSI were not worn on shirt sleeves, but only on the coats. Actually, I believe there was an order to this effect. I know it is hard for reenactors to wear shirts without sporting them, but all evidence points to this. Another point for those who want to be strictly accurate regarding the type of shirts worn; the pre-war khaki shirts had full plackets and collars designed to be worn with a tie along with brownish colored vegetable buttons. The 1943 issue shirts one sees without the placket on front and lower top button were designed to save manufacturing time and to be worn with the collar open and laying flatter around the neck. 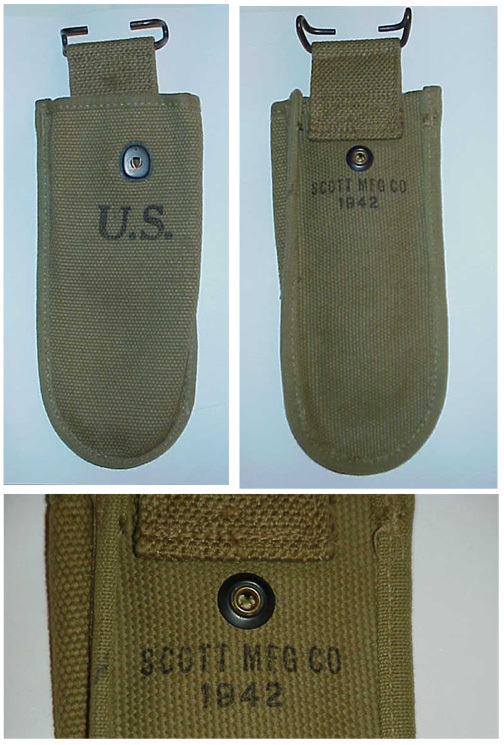 These have the commonly seen lighter khaki colored plastic buttons as well. Additonally, most of the flannel shirts issued to the Scouts were actually the ww1 issue pull over type with half button down fronts.